Throughout the state of Texas, Texans have always been in search of the perfect cut of steak from their Dallas steakhouse. From a juicy strip to a Prime Rib cut of beef there is one steak that is legendary among all steakhouse visitors; the Tomahawk Steak. Once a steak that seemed to be only myth, Y.O. Ranch Steakhouse is proud to serve this cut that deserves a much deeper look into what makes it one of the best cuts in the business. The Tomahawk steak is one of the most desirable cuts of meat at a Dallas steakhouse. This unique cut is usually served in a very large portion and most couples split this steak when it is ordered for an entree. The Tomahawk steak is a bone-in rib-eye steak that comes from between the 6th and 12th rib of a cow. The steak usually weighs between 30 and 45 ounces and is well-marbled with fat and cooked to the perfect amount of tenderness and flavor. Due to its strong, natural flavors, this steak usually requires little seasoning from your Dallas steakhouse chef. 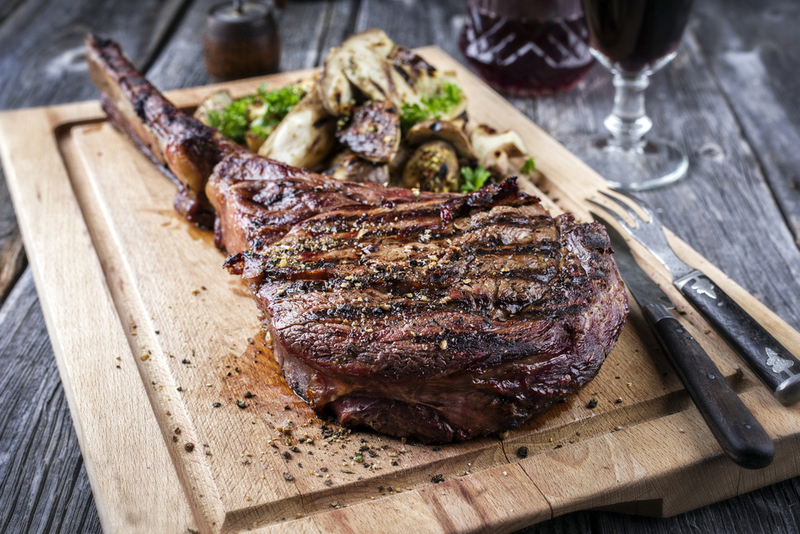 The history of the Tomahawk steak is about as rich as its flavor when the beef reaches your taste buds. The history of the steak goes back to the days of Rio Grande cattle drives when the cowboys of Texas used the spices of Mexico to flavor their meals. The long rib bone that has been flayed of its meat gives this steak the appearance of a hatchet or a Native American tomahawk, granting this cut its descriptive name. Not only does the steak have a unique and dramatic look, but its history and impressive size make for a sophisticated presentation that is sure to impress even the most well-seasoned Dallas steakhouse guest. Is This Steak Good For You? When examining the nutritional value of a Tomahawk steak, it is an obvious choice why most couples choose to split this dish on date night. Enjoying a Tomahawk steak from Y.O. Ranch ensures that your dinner is going to be packed with the right amounts of proteins and other steak-filled nutrients that bodies need in moderation. A typical Tomahawk cut weighs in at 288 grams of protein and 120 grams of fat. Steak from a Dallas steakhouse has all of the nutrients that the body needs from all-natural, grass-fed beef. If this post has sparked a craving for a Tomahawk steak with a delicious flavor, then Y.O. Ranch Steakhouse is pleased to announce that we serve Tomahawk steaks on our nightly dinner menu. Come take a seat at our dinner table and share a special night with a loved one at Y.O. Ranch Steakhouse. Don’t forget to make a reservation and save room after your Tomahawk steak for one of our signature desserts.